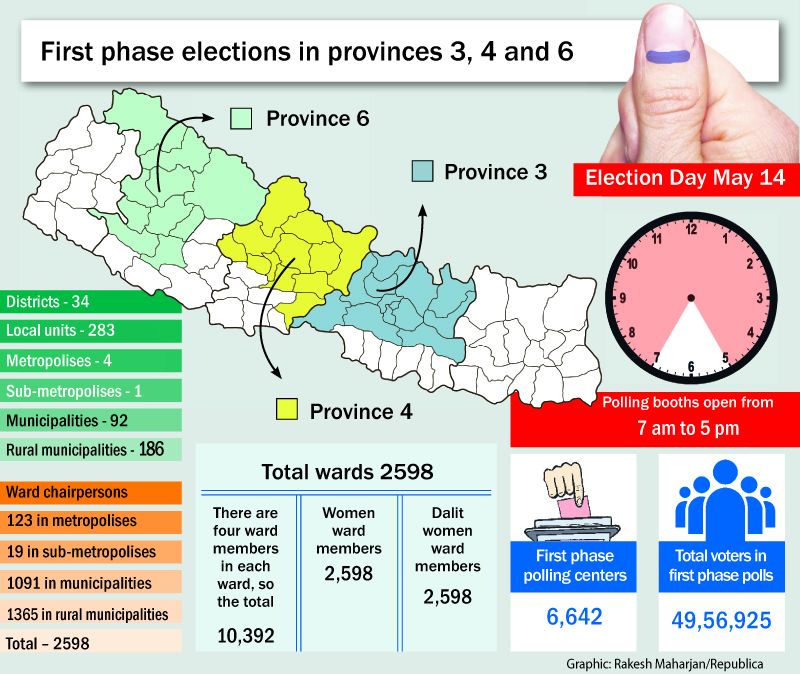 KATHMANDU, May 2: Political parties and independent candidates in 34 districts of three of the provinces registered their candidacies for the first phase local elections scheduled for May 14. Candidacy registrations were largely peaceful. Encouraged by the looming elections, leaders and cadres of major political parties and independent candidates reached the local election offices and registered their candidacies with fanfare. The elections are taking place after a gap of 19 years. “I am extremely happy today. Candidacy registrations have concluded in all 283 local units in a peaceful manner. This has now ensured the May 14 elections. Also, it has paved the way for holding the remaining elections,” Chief Election Commissioner Ayodhee Prasad Yadav told Republica after the nominations concluded. As per the EC’s program, the candidates filed their nominations for local elections within the set time period. In some districts, election officials had to work till late evening due to the increased number of candidates. “We cannot turn back candidates as they had appeared at the election office before the expiry of set time,” said Election Commissioner Ila Sharma. At the time of going to press, returning officers in Kathmandu were busy calculating the number of candidates. “We are still taking updates from local returning officers. The final number of candidates and the representation of women, Dalits and marginalized communities will be compiled only by tomorrow,” said EC Spokesperson Surya Prasad Sharma. Sharma said the general public and the parties will be allowed to register complaints against any candidates on Wednesday. Soon after getting the complaints the EC will make public the details of the candidates and investigate the complaints. “The commission will give a chance to withdraw candidacy by Thursday if anyone so wishes. Then we will make public the final list of candidates,” he said. Parties and candidates contesting the elections will get their election symbols on Friday. Parties other than those represented in parliament and independents will have to contest with independent symbols, according to the electoral laws. Only parties represented in parliament will contest with their party symbols. As part of conducting the polls in two phases, the government has announced the first phase elections for 283 local units in provinces 3, 4 and 6. Elections in the remaining provinces are scheduled for June 14. Experts in election matters say the local elections have opened the avenues for the marginalized communities. At least 40 percent women representation has been ensured in the local units. Their nomination as chiefs or deputy chiefs of local units is also a mandatory provision. Despite progressive provisions for the representation of women, Dalits and the marginalized in the constitution and the electoral laws, only a limited number of women candidates registered their candidacies. Most of the parties have confined women candidacies for the deputies of the rural councils and municipalities. The offices of chief returning officers and returning officers are operating at the local units. The constitution has clearly mandated three sets of elections-local, provincial and central-by January 2018.